You have a new proposal: to be a full-time merchant and adventurer, to play your life by getting materials that later on someone will want to buy in your store. All in an RPG of action with influences roguelike that enjoys a high difficulty and a more than convincing duration. You want to know more? 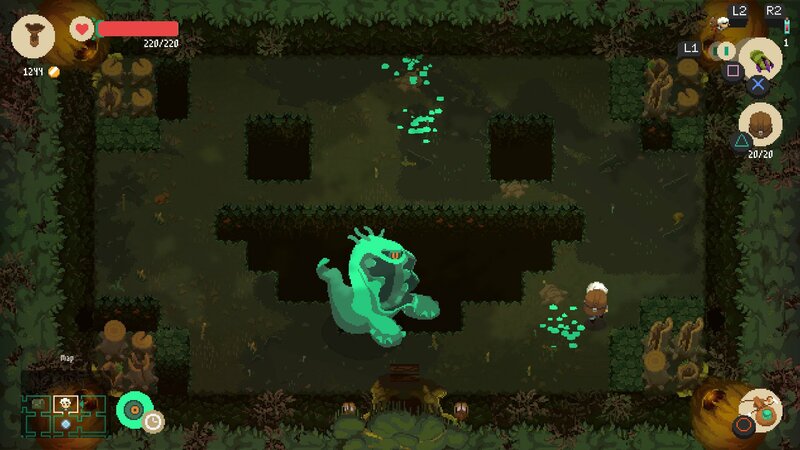 Here the analysis of Moonlighter. We are in front of one of those video games that might seem little at first, waking up curiosity after the first few minutes and surprise you after learning that you have already played a few hours. 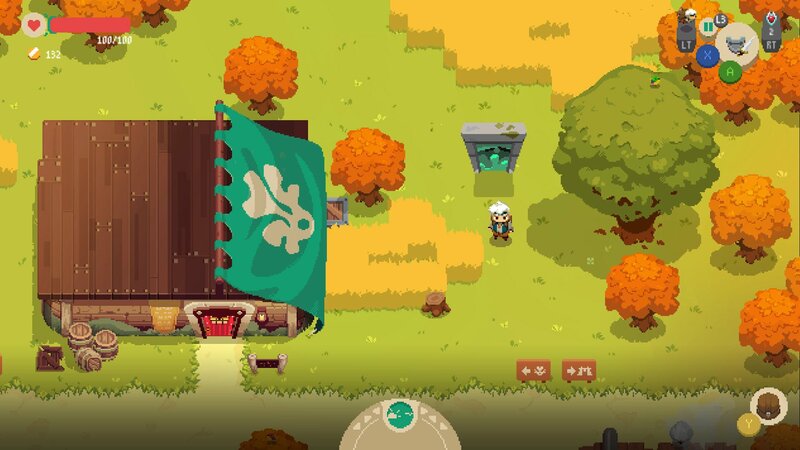 Moonlighter is the first original project of Digital Sun , a young Spanish studio that proves its worth. Not only have they been based on collecting ideas from other games, but they have taken them to their own terrain to give rise to something that feels as attractive as it is different. And that has a lot of merit. It picks up the aesthetics of titles like Zelda , from the era of 16 bits. It accompanies a very damn difficulty to the Dark Souls . It integrates a management mechanism similar to that of the Harvest Moon series . Use dungeons that are generated randomly as in The Binding of Isaac . Then it also has a powerful looteo, dynamics of selling objects, construction of equipment, progression in a city … All in the same game, and the magic is that everything fits and combines in playable terms. As a result, we have an RPG of action with elements of rogue like that gives enough hours of play, that has a very well adjusted difficulty, and that above all is designed for players of the old school. Visually it is charming, a tribute to the adventures of the nineties, and musically it is an absolute delight. It only subtracts points a rhythm of game that can get to be quite slow, as well as a somewhat chaotic inventory management. But otherwise it is one of those “indies” that should not be missing in your game room. 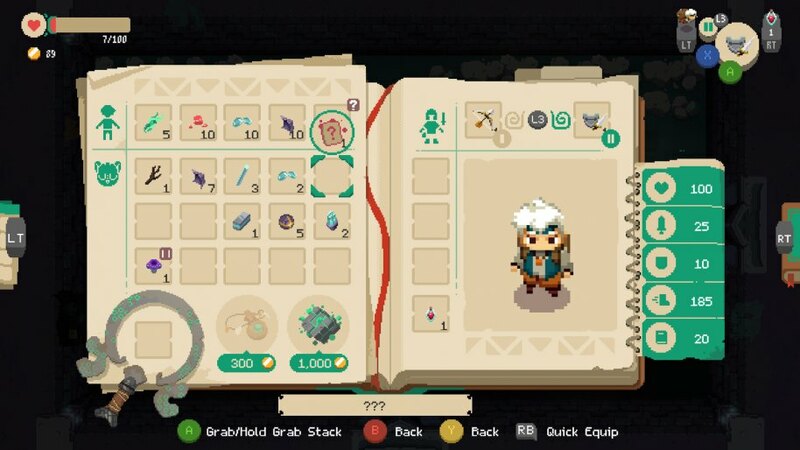 Adventurer and full-time merchant: Moonlighter’s narrative has no complications. An adventurer and merchant decides to explore the mysterious dungeons that surround his city. They tell him not to do it, that he could lose his life, but we all know that in a video game those are enough words to awaken anyone’s motivation. There is a little more “lore” as we go, but the story is the least. Here we have come to draw the sword, kill monsters and get great treasures . That’s what the five dungeons are all about. A part of the action runs in your village, where you can improve equipment, but above all exercise as a merchant in the building shown in the image. The most characteristic of the approach is that it opts for dungeons generated procedural and of high difficulty. Each dungeon is divided into several sub-levels, and each of them in multiple rooms in which a good variety of enemies appear, each with its attack patterns. There are rooms where the doors do not open until we have cleared them, others have chests and some contain lakes of revitalizing water. These bases are repeated in all the dungeons, each with its theme and final bosses . Visually it is charming, a tribute to the adventures of the 90sHowever, this is a video game designed so you do not overcome the dungeons to the first. The death teaches you that you should be cautious, and you’d better withdraw in time to lose all objects and advances wore. “Greed broke the sack”, says a message in the game, and perfectly explains the balance you must maintain. Enter dungeons, go as far as you can, collect everything that fits in your backpack, run away, recover energy, improve equipment and try again. The cycle is incessant and it works because the dungeon is never the same every time you access it. Inventory management has its crumb, because there will be objects that will destroy others, depending on the position in which we place them. Sorting everything is like a puzzle. In the end, it may take 30 attempts easily to overcome one dungeon and access the next, which translates into a few hours of play, and several days in the virtual calendar of the game (there is a day-night cycle ). 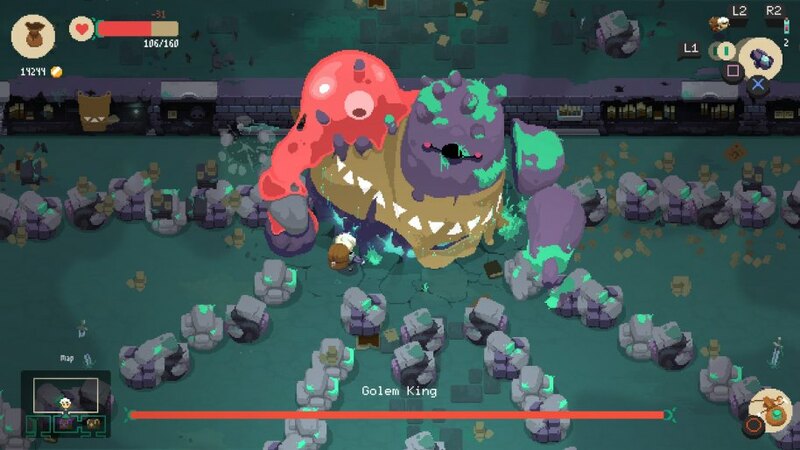 In addition, as you overcome dungeons, more possibilities open up, because you can return to the previous ones to lootear , the undisputed key of the powerful progression that Moonlighter has. The central dynamics of the game is about overcoming dungeons, but there is another parallel mechanics, just as important: sell the objects obtained . So we not only overcome dungeons for adventurous motivation, but because we know that it will provide us with objects to overcome increasingly higher challenges. It works like this: we own a business and we must sell the best items that we find. We assign prices on the basis of trial and error, considering the reactions of customers. It is one of those indies that should not be missing in your collection.It seems simple, but it is very gratifying to see how our funds increase depending on the effort invested. The money is subsequently used to improve the premises, expand the city or obtain all kinds of improvements. That is to say, a design of cyclical progression and perfectly defined that puts in relation our liking by the exploration of dungeons with the facet of making a living in the trade of seller. We fight to win materials, and sell them to keep fighting . We have loved the proposal. Of the few things that do not change in the dungeons are the bosses. Everything else varies every time we access, something that forces us to improvise. How could Moonlighter have improved? Probably, inventory management is somewhat chaotic at times. Some loading times can be high. Also, the progression is sometimes so slow that it can generate frustration (luckily, three levels of difficulty are integrated ). However, the assessment is positive, also because its audiovisual aspect comes in conjunction with the playable spirit. In other words, a retro character that brings out a pixel-art aspect that picks up a lot of influences from the classic The Legend of Zelda: A Link to the Past , although with its own spirit, we must also say it. Musically it is a work that has left us surprised by its melodies, sometimes precious, that change not only with each dungeon, but within them. This accentuates the sensation of progression of a videogame designed to improve us and to live an adventure that seems that we have already experienced in the past … but that really is not like that. And is that you have rarely played a video game with a full-time RPG contract: day merchant and night adventurer. 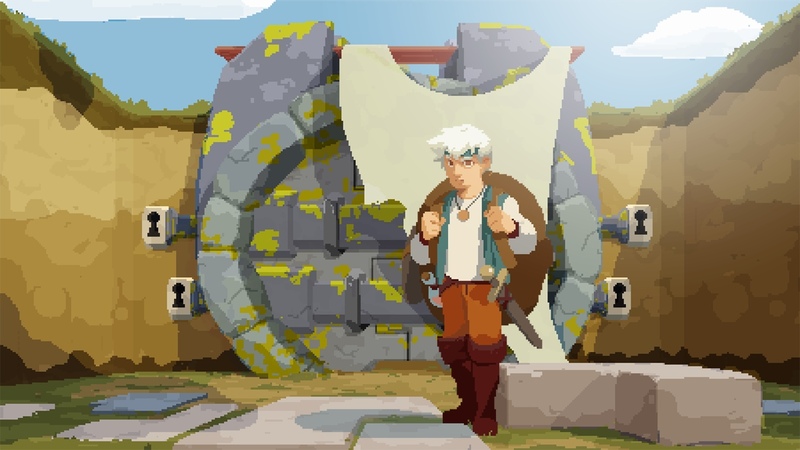 Moonlighter is one of the best news for the indie scene, and the genre rolero, this year. 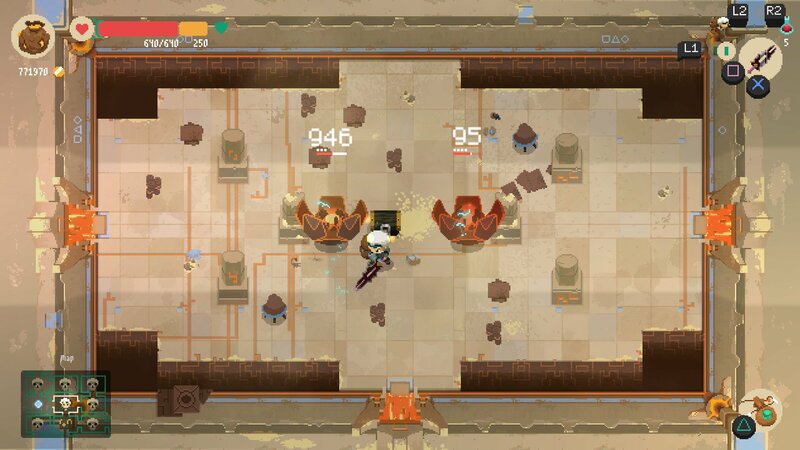 An RPG of action with tints of roguelike that contains ingredients of several video games, but that knows how to conjugate them to give us something with its own essence. It is difficult but rewarding, complex but at the same time easy to understand … It is action and role of the old school with a sensation of brilliant progression and enormous addiction capacity that we are sure will satisfy the most adventurous players.